The second point we made at SF Music Tech related more directly to technology’s impact on musicians’ earning capacity. 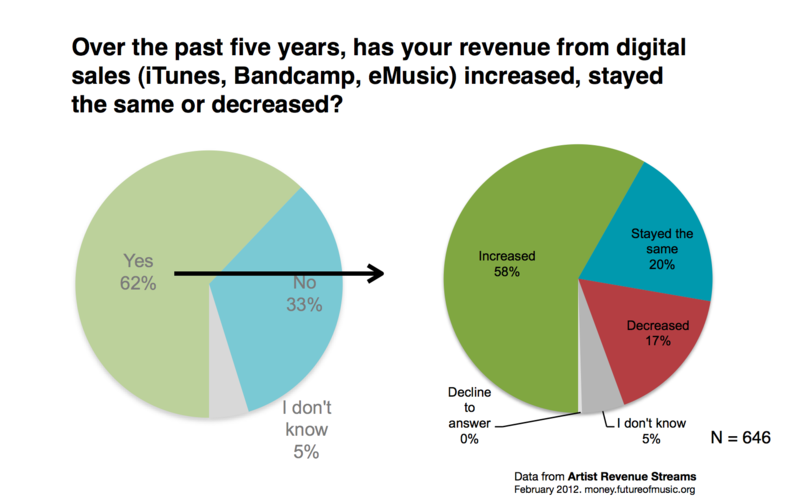 Based on survey findings and interviewee feedback, income from digital download sales – especially from iTunes – seemed to be increasing. But we say this with a large caveat; this only applies to musicians and composers that benefit directly from the sale of sound recordings. The survey also asked very specific questions about musicians’ and composers’ income related to about 20 significant revenue streams, everything from mechanical royalties to live performances. See the list of revenue streams examined in the survey here. Below are charts related to three possible sources of income from the digital transmissions of sound recordings: (1) income from digital sales/downloads; (2) income from interactive streaming services; and (3) income from digital performance royalties paid to featured performers. We chose to focus on just these three at SF MusicTech Summit to match audience interest (which included lots of music/tech folks), and to keep within the 30 minute time slot. See the additional revenue streams that we’re studying here. We began by presenting data about digital sales of sound recordings. This includes sales of downloaded tracks or albums from iTunes, CD Baby, eMusic, Amazon, or off an artists’ own website. 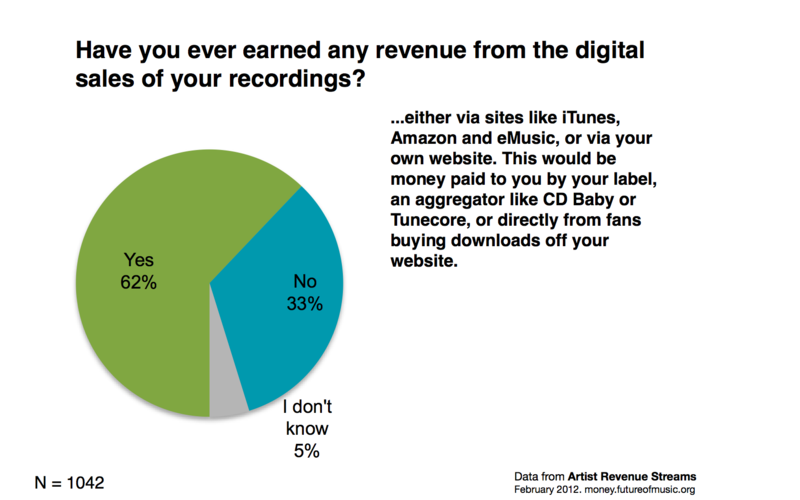 When asked whether they had ever earned any revenue from the digital sales of their sound recordings, 62 percent of survey respondents said, yes, they had earned something. For the 62 percent who said they had received some income from digital sales, we then asked them whether that income had increased or decreased over the past five years. For 58 percent, it has gone up over the past 5 years. For 20 percent, it has stayed the same. 17 percent have seen a decrease. For those 58 percent who said it had gone up, we then asked them why. The top answer was that consumers’ purchasing habits have changed. This shouldn’t be a shock to anyone, but it’s helpful to hear this from musicians themselves. 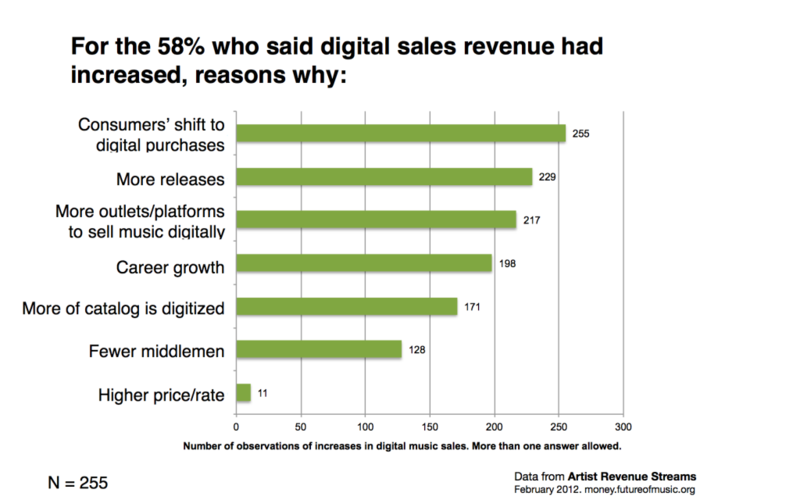 The other reasons are also obvious: if you have more releases out there, or more of your catalog is digitized, there’s an opportunity to make more money from digital sales. And, there has been an increase in the number of platforms to sell music digitally over the past five years. 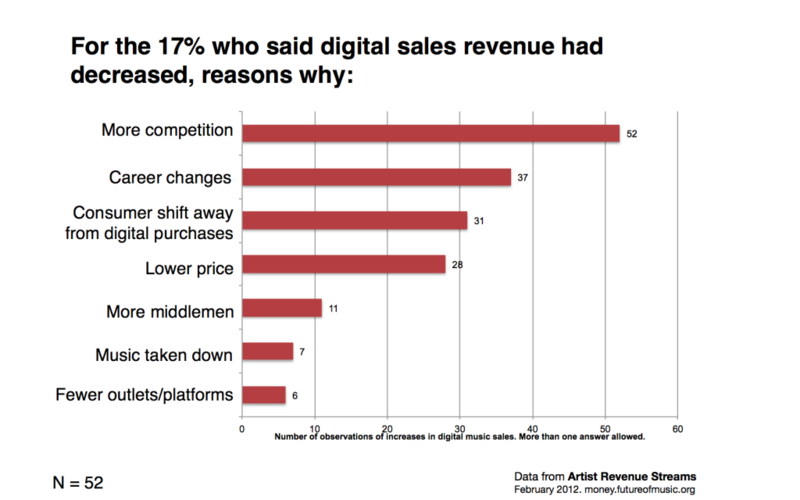 What about those 17 percent who had said their income from digital sales had gone down? The most notable reason: more competition. This is the consequence of leveling the playing field; it is now so easy for musicians to participate in the digital marketplace that it’s flooded with content. Naturally, this means there’s more competition for consumer’s attention, and dollars. To summarize, a majority of survey respondents (62%) have seen some income from digital sales and a majority of those people (58%) said that this revenue has increased over the past five years. They recognize that consumers’ behaviors are changing, and that making more of their work available via digital stores leads to more income. This was a trend echoed by our interviewees.